The compact palmOTDR now offers even more testing capacities, flexibility and value with combination of 850/1300/1310/1490/1550/1625/1650nm (Mono/double/triple wavelength) OTDR, 1310/1490/1550nm PON Power Meter, Stabilized Laser Source and VFL. 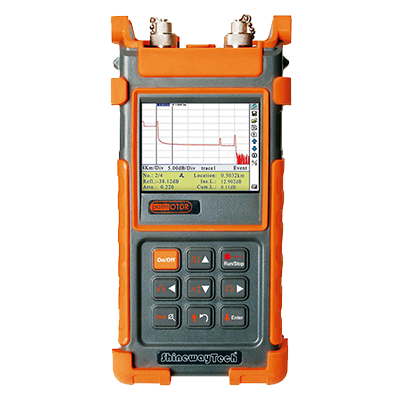 The OTDR wavelengths cover the applications of regular end-to-end fibre characterization (1310/1550nm), premise/enterprise LAN testing (850/1300nm), FTTx fibre link construction verification (1490nm) and PON live fibre troubleshooting (1625/1650nm with filter). The integrated PON Power Meter can perform in-service testing of all PON signals (1310/1490/1550nm) on any spot of the network featuring pass-through design and burst mode support. palmOTDR is your ultimate solution to meet various testing requirements of entire fibre network.